‘Fruits of our land’ by Jasmina Cibic for Moving Images London. The film, Fruits of Our Land was shot specifically for For our Economy and Culture, Jasmina Cibic’s project for the Slovenian Pavilion at the 55th Venice Biennial that explored issues around national representation and its framing. 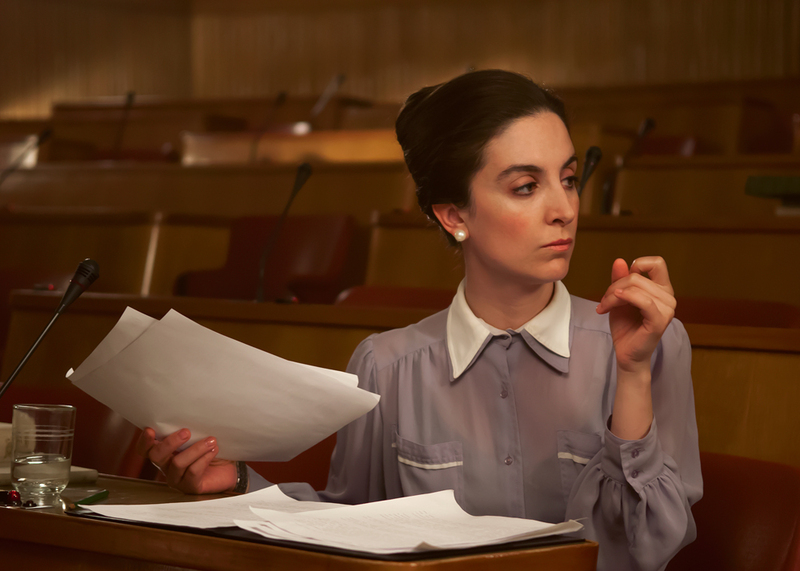 The film presents a recreation of a 1957 parliamentary debate between politicians, architects and art historians, set up to decide which artworks might be suitable (i.e. nationally representative enough) to ‘decorate’ the newly built People’s Assembly. The script is a word-for word re-enactment of the transcripts found in family archives of the politicians of the era and it presents a specific moment within the months long actual debate: the discussion around a singular proposed artwork with the title Fruits of Our Land. The artwork in question ended up being the only artwork in the history of postwar Yugoslavia with politically benign motives that was censored. Despite the benevolent figures of children and fruit sellers that the artist had proposed, this entry elicited great emotional outbursts from the leading state politicians. The script that presents a non-resolute debate around ideological vision amongst the members of the “Committee for the Review of Artistic Works” further examines modes of exchange, reception and constructions of identity. The re-imagining and re-contextualising of issues around soft-power and how nation states select their iconography with which they go on to market themselves, dramatizes not only the power paradigms inherent in systems of authority, but also the explicit contradictions present in the transmutation of a national identity from past to present, place to place.